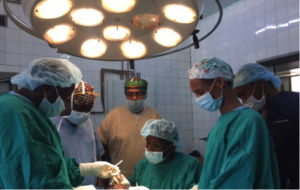 Mission: Restore and partner hospital Bugando Medical Centre in Mwanza, Tanzania, completed our third surgical training trip on Reconstructive & Plastic Surgery November 2017. 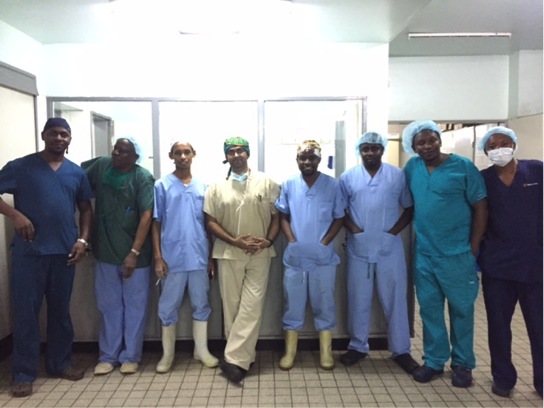 It was a successful week of operations, interdisciplinary team training, and surgical skills building & learning. Dr. Peter Biribwa, a Ugandan Plastic & Reconstructive Surgeon (trained at the University of Nairobi Kenya National Hospital), led the trip, operating alongside five Bugando Medical Centre surgeons and conducted training with Burn Unit Nursing staff and the designated Physiotherapist for Postoperative care tactics. The training started Monday, November 27th with patient clinic and a two-hour lecture on Wound Care and Postoperative Management by Dr. Peter. The audience included 36 participants, the majority being Assistant Medical Officers from Kigoma, Mtwara, Morogoro & Bukoba- rural regions outside of the Mwanza region, Burn Unit Staff (surgeons, physiotherapist, nurse), Bugando Registrars & Residents, and Tanzania Rural Health Movement Staff & Nurses. Together, Dr. Peter and the Bugando surgeons operated on patients from the Burn Unit, focusing on burn wounds and one orthopedic case. Over the course of four days, the team operated on 14 plastic & reconstructive surgery cases. The training consisted of skin graft procedures, scar excision, post-burn contracture releases, ectropium release, and a series of flap procedures (groin, pedicle scapular, and rotational). Eleven of the fourteen patients were under the age of 10 years old, and all sustained injuries that impaired patient functionality. Surgeon participants included: Dr. Vihar Kotecha (General Surgeon); Dr. Phillip R. Makoye (Registrar, Head of Burn Unit); Dr. Alyoces Nuri (Registrar); Dr. Dino Mwaja (Resident); and Dr. Peter Kitenyi (Resident).